As a mother and grandmother with a doctorate in education and a master’s in counselling Ruth Truman is eminently qualified to write about campus life. The author also has forty years of experience as a United Methodist Church pastor’s wife and seventeen as a teacher and university counsellor and administrator. 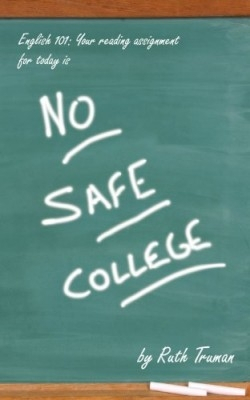 Her novel No Safe College amply illustrates that she is an accomplished and insightful writer as well. Although it is fiction her book is “based on happenings from the lives of many students.” It’s a rewarding read for student services personnel and students in all university years but will especially benefit freshmen and their parents. In fact the story Truman uses as the vehicle for conveying her message is so well done and non-preachy that it will appeal to anyone interested in the tensions modern youth face once they leave home. Truman’s intent is to make prospective students and their parents aware of the pitfalls of attending any college even a Christian one like Callegua with its promise of “Education with a Difference.” To do so she relates the adventures and misadventures of four dorm mates as they meet clash and attempt to resolve their differences. Joan is the naive narrator; Trish the focused Christian; Angie the moderate campus leader; and Sue is the football team’s party girl. The mundane activities of college life are neatly interwoven into the main story lines which are told with the requisite amounts of suspense. In the dedication for her novel Truman thanks her husband Reverend W. Lee Truman “who insisted this book be published.” It was excellent advice.